Nigh pornographically heightened levels of paganistic pride run through this third album from Meerssen, Netherlands extreme thrashers Bifrost as they’d long carried and incensed a greater torch for the scholarly defiant legacy left behind by British classic thrash masters Sabbat. Conceived in 1992 with their sound additionally informed by Skyclad‘s early innovations as well as the growing legacy of Quorthon (Bathory) these Dutch fellows began with a fully formed atmospheric vision of thrash metal that expanded from their ‘Western Magick’ (1993) demo and only grew from there with the unique, comely rhythms of ‘Pagan Reality’ (1995). There is certain magic to be experienced within the band’s first two records as the band stayed true to their love of classic thrash metal while gaining influence from the progressive mentality of their idols. Black metal was mutating wildly by the day and pagan metal began to take on more serious forms across Europe and by the end of 1997 Bifrost had disbanded. Vocalist Guido Heijnens focused on the full-time job of growing his now legendary Hammerheart Records label. The rest of the band took part in Viking themed semi-melodic death metal project Shadowbreed, who more or less resembled Ancient Rites‘ pre-keyboard dominated era. 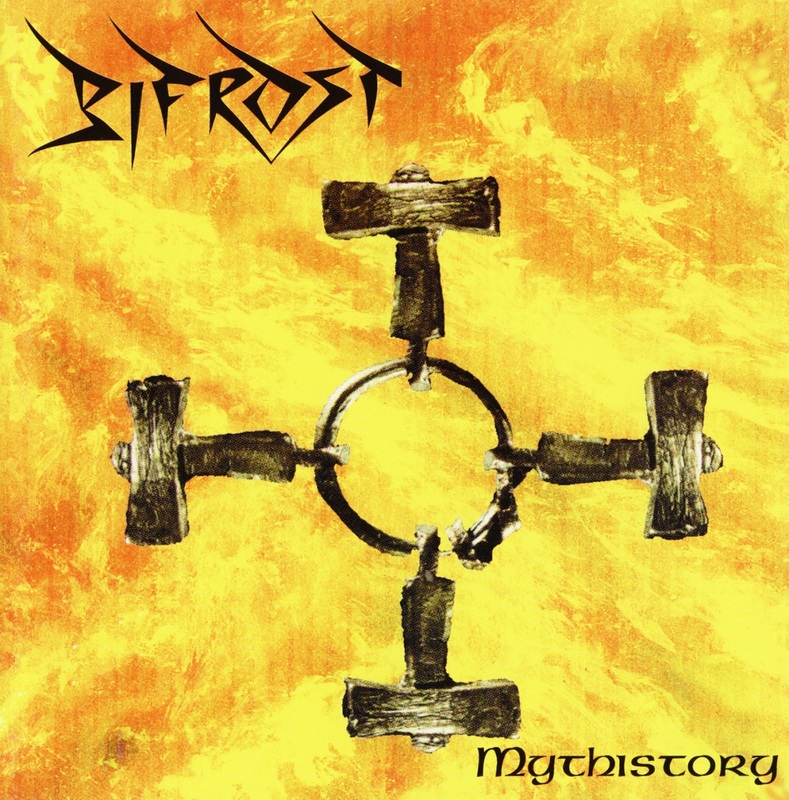 The band would largely reform under the name Conquered My Fears without guitarist Roger Hermans (then in Shadowbreed) and upon realizing that their reformation and new sound was basically Bifrost, they changed the name back and put out their third full-length ‘Mythistory’. If ‘The Wildest Fire’ (1997) felt a bit like it was influenced by the staccato technicality of progressive thrash metal then ‘Mythistory’ will appear as a far darker blackened thrash metal record with a heavy dose of the keyboards that were synonymous with symphonic black metal’s uprising at the time. Classic thrash metal heads who were on board for the weird-thrashing of first two albums will no doubt be alienated by the heavy use of synth/keyboards in the early stages of this album. With about fifteen years in between first impressions and a healthy amount of time spent revisiting Bifrost I’ve generally come around in terms of ‘Mythistory’. Beyond the loud keyboards that jump in throughout the bulk of the record the guitar work feels even more orthodox, or at least simpler than previous. With a signature guitarist removed a focus on jogging, classic heavy metal rhythms stretched and twisted into previously unheard forms with some small resemblance to an early Varathron/Rotting Christ-like blackened epic heavy metal stomp but with that early thrash metal influence even more pronounced; The oddly loud keyboard work actually helps to accentuate this comparative sensation. If at any point in their career Bifrost were able to achieve their goal of toughening up the ‘soft’ progression of Skyclad beyond ‘The Wayward Sons of Mother Earth’ it may just as well have been ‘Mythistory’. An oddly underground late 90’s pagan themed blackened (kinda symphonic) thrash record with just as much stylistic ‘interference’ as you’d expect from its mush of sub-genre specifics, ‘Mythistory’ was granted with truly unique personality that will absolutely only hold its weight with an ultra-specific crowd. 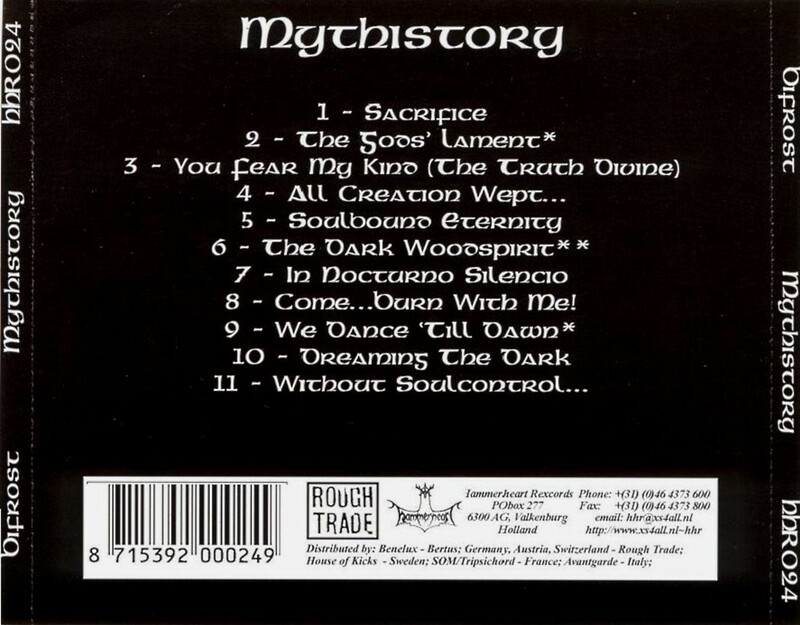 Normally I would have just run right to ‘Pagan Reality’ and championed it easily but ‘Mythistory’ is a more challenging entry point and carries with it a brilliantly bold musical statement and a kicking warrior’s spirit that you won’t necessarily find outside of Quorthon‘s jagged thrash metal phase. Inspired performance and wild, ripping thrash rhythms easily trump fidelity and balance in many cases, so if you’re interested in an album that takes some concerted immersion this third and final full-length from Bifrost carries an ambitious, relatable spirit within. Posted in Heavy Metal, Reviews and tagged 1998, bathory, bifrost, bifrost 1998, bifrost black thrash, bifrost mythistory, bifrost mythistory 1998, bifrost mythistory black thrash, bifrost mythistory hammerheart records, bifrost mythistory netherlands, bifrost mythistory retro review, bifrost mythistory review, bifrost mythistory youtube, bifrost netherlands, bifrost pagan metal, bifrost thrash metal, black metal, black thrash, black thrash metal, black thrash metal 1998, black thrash metal review, classic thrash, conquered my fears, death metal, grizzly butts, grizzlybutts, hammerheart records, hammerheart records 1998, hammerheart records bifrost, hammerheart records mythistory, Heavy Metal, mythistory, mythistory 1998, mythistory album, mythistory album review, mythistory bifrost, mythistory bifrost 1998, mythistory review, netherlands black metal, netherlands metal, netherlands thrash metal, opinion, pagan black metal, pagan black thrash, pagan metal, pagan thrash, retro, retro metal, retro review, retro thrash, retro tuesday, retro tuesdays, retro tuesdays 2018, retro tuesdays october, retro tuesdays october 2018, review, Reviews, sabbat, shadowbreed, skyclad, symphonic black, symphonic metal, symphonic thrash metal, thrash, thrash 1998, thrash metal, thrash metal review, thrash metal reviews. Bookmark the permalink.